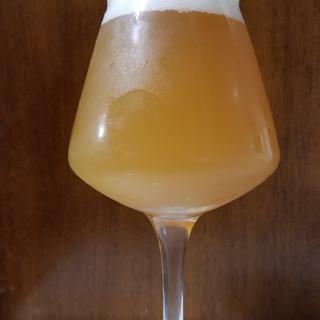 This IPA recipe is our take on the hazy North East IPA, also known as New England IPA or Juicy IPA, it is one of the fastest growing beer styles in the US. The style accentuates hop character while maintaining a smooth and creamy mouthfeel. Light in color but hazy due to heavy dry hopping, yeast selection, as well as additions of oat and wheat . Low in bitterness with a huge hop character due to hop-bursting, this beer will satiate even the biggest hop head. The North East IPA has become popular nationwide thanks to breweries like Tree House Brewing, The Alchemist, Hill Farmstead and Grimm Artistanal Ales. After my first taste of this delicious style, I knew that brewing it at home was a must. Brewed this before and really like it. My son wanted me t brew this type and good reviews. It looked tasty and just qualified me for the free shipping along with the rest of my order. Just kegged my first batch of this, and can't wait to brew it again. I've brewed it several times now and really like it. Great kit. Great deal for all of the ingredients you receive. Brewed it several times now and it is outstanding. I"m using it as a base recipe and tweaking the hops a little for variation. Does that make me hazy? Does that make me crazy? Possibly. Wanted to try a NEIPA. Had great luck with the MoreBeer kits. Great luck with Drakes IPA kit. This cloudy? hoppy? golden? IPA kit looks to be a safe bet. I liked the "More Haze" kit, and thought I'd give this a try. I love NE-IPA's and more Beer hasn't lead me astray yet! Awesome kit. Great IPA kit. Great results with this kit. Absolutely fantastic kit. Great comments from everyone that tasted my first batch. Will be gone soon, so what's I guy to do but get another batch into the fermentor. I've brewed this kit before and was very pleased with the result. Saw a youtube video review on it. My husband is a huge beer nerd and I'm trying to purchase this for him as a surprise. Recipe says dry hop days 3-7 and 7-10.. does that mean to dry hop For from day 3 until day 7? Or dry hop for 3-7 days? BEST ANSWER: I've made this beer four times now. It's a favorite in my extended family. I have tried it both ways. It works fine either way, but I think the the beer has a juicier, slightly less hop forward finish if you use the later approach. I consider day 1 the day when fermentation actually starts. May take a day or two. I let it ferment from day 1 to 3, then add the first dry hop in the primary from days 3 to 7. Then rack to secondary and add the second dry hop from days 7 to 10. Also, I don't normally use strainer bags, but in this case, I find it helps. I keg and, with all of the hop additions, I find it easier to get a clean beer into the keg. Hope this helps. Haze Craze is a delicious beer. Enjoy! I took it as dry hopping the first 3 oz in the primary for the last 3-7 days in primary. Then racking the beer to secondary and adding the other 3 ounces for 7 to 10 days. So when I brewed this I let the primary go for a week until fermentation was about complete, added the first dry hop for a week, racked to secondary and dry hopped at that time and let it sit for another week and a half. Turned out great. This is a good recipe! They are rough days into fermentation. Wait until day three or when the violent fermentation has subsided. This will keep the CO2 from carrying away all the aroma goodness of the first hop dose. Add them with a hop bag so they can be removed after 4-5 days. Then add the second batch for another 4-5 days. This regiment works really well to keep the hops flavors and aromas fresh without the potential for any grassy flavors. At that point (10-12 days after pitching) I keg it and start a forced carbonation. If you are bottling you may want to remove the second hop addition and let it go as long as required to hit final gravity and avoid over carbonating in the bottle. There are two scheduled dry hop additions. I use a hop spider, but you can use a grain bag. Add the hops for the first addition to the bag and weigh it down with something sanitized like a glass marble or a small glass jar (jelly jar). Add this to the fermenter on day 3 and leave it in. Do the same for the second dry hop on day 7. After day 10, rack to your bottling bucket or keg. Then clean up the mess. Ideally this means you would dry hop at day 3 (of primary fermentation) until day 7. Then perform transfer to secondary and during secondary (days 7-10) you would dry hop th rest per brew instructions. I took these as suggested guidelines as you may not be able to transfer at 7 days if gravity reading is higher than expected. I think they suggest using a hop bag, add the first dry Hop charge on day 3, pull it on day 7 and add the second charge at that time. I did not use a bag and instead just added the second charge on day 7. The issue is you can get a grassy off flavor if you dry Hop too long. Mine came out great. Hope that helps. I would add first dry hops on day 3 after putting in fermenter in a hop bag. On day 7 pull hops and add the other hops in a bag from day 7 to 10th day in fermenter. On day 10 pull the ladt dry hops out and wait for fermentation to complete. I added the first dose of dry hops at day 3 during fermentation and added the second dose of dry hops at day 7 of fermentation. I left all of the dry hops in the fermenter until day 10 when I kegged the beer and it was fantastic! For 3-7 and 7-10 days as in length of time not days of fermentation. I would let the krausen fall before I started dry hopping. It'll preserve some of those delicate flavors, they wont get driven off with all the CO2. When I brewed this beer I put the first dry hops in at day 3 (before the krausen falls) then the second batch on day 7. At day 10 I racked the beer into the keg. I never took out the dry hops after adding them. addition after 7-10 days. BTW , a fantastic recipe! Dry hop from day 3 until day 7. Then dry hop with additional hops additions from day 7 until day 10. Good luck. This is a great recipe. Dry hop from day 3 through day 7, then add the second charge from day 7 through day 10. Enjoy!! Dry hop on days 3-7, then on day 7 transfer to secondary and dry hop for 3 more days. I did the dry hop regimen that Douglas Tripp did and the beer came out great! I must have screwed something up. My original gravity reading came in at 1.030!! I pitched the yeast anyway, which took off around 16 hours. It's been about three days and my brew looks like a milky mess! This is the first time this has happened. I use an online mash and sparge calculator for my water and temp levels. All my temps were good, I'm thinking maybe I used too much water? Any input is appreciated! Thanks. BEST ANSWER: Hi Rick - This is unfortunate, which brewing calculator did you use? What is the preferred yeast for this brew? BEST ANSWER: I used White Labs WLP095 Burlington Ale Yeast and got great results You could substitute some of the English style ale yeasts and get similar results. You have to make a starter. You've got a few well known options for this type of beer. I used Wyeast London Ale III (This is used by most for NE Style IPA's). You could also you the Yeast Bay Vermont Ale strain. 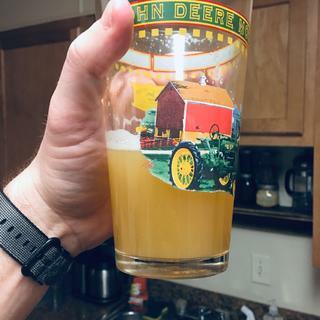 I've used Imperial's A38 Juice strain on a number of NE Style IPA's with great success as well. Vermont Ale yeast (multiple brands carry) or Wyeast 1318 would be my recommendations. Vermont is true to style. But I think 1318 is even better. I have used both White Labs WLP095 Burlington Ale and Wyeast 1318 London Ale III. Both with excellent results. I used WLP095 Burlington and was happy with it. Stayed nice and hazy and let the hops shine. GigaYeast Double Pitch - GY054 Vermont IPA Yeast is the only way to go!!! GY054 Vermont (Conan) in my opinion is the best choice for this recipe. I used White Labs 095 Burlington Ale and it worked out pretty nice. I used London ale iii and was very happy with the flavor. I used the White Labs Burlington ale yeast. I used Wyeast London Ale lll. Was great. WL095 Burlington Ale worked well. Anyone try and spike it with 1lb of corn sugar to get the ABV to around 7? 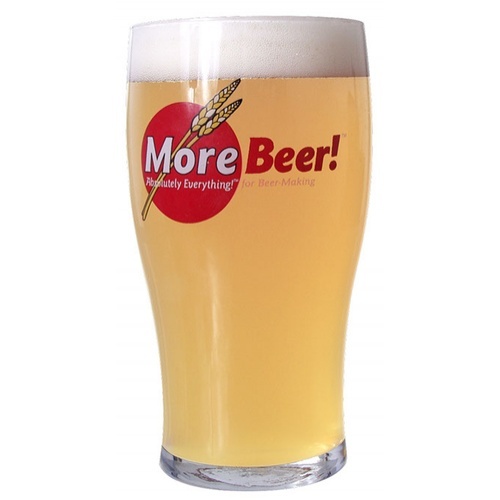 BEST ANSWER: Hi James - We offer a MoreHaze! Double IPA kit, if you're in the need for more ABV while maintaining the mouthfeel specific to this style. Corn sugar will thin it out a bit, may loose some of the mouth feel that goes with the stlye? Maybe add more base malt? Either way it's your brew- there are no rules, cheers! I've never altered the recipe of this kit. It is so good, I can't say I would take any chances of making it less so. Also not sure pushing the original gravity higher would be a worth the additional stress it may cause the Conan Strain yeast. Hi Mark - Conan yeast will crush your enemies and see them driven before you. But, but, but,,,, what about the lamentation of the Women? Haven't tried that, but for this style the higher ABV might take away from fruityness that makes this kit special. 1 Ounce of whole cone only? Rest are pellets? Yes, that is correct. 1oz whole cone and the rest are pellets. It's actually 2oz at flameout and yes, the rest are pellets. Love this brew and wish I would have ordered a couple more at the time. I didn’t do a full boil with the hops as described because I didn’t want the bitterness of a standard IPA. Suggest if you want a more New England style, don’t boil hops at all - put in once temperatures reach 170 post boil. Absolutely fantastic beer!! To get the permanent haze and insane aroma I made sure I didn’t start whirlpool until temp was just under 180 F and after Primary I crashed to 40F and pulled the trub to get all the yeast out. Let it go back to 67F and did final dry hop additions. Before kegging I did a second crash to 40F. Aroma was incredible and had perfect thick haze till the last drop. 5 gallons lasted about a month. I couldn’t believe the permanent suspension and aromas I achieved with this technique. The only thing I did different from the recipe is that I added 2 OZ of Galaxy as my final hop addition. Probably didn't need it but wanted to use it before it got to old. I think pulling all the yeast and then doing heavy dry hop was key.... Ordering again now!!! Hello Joe - Nicely done, they taste best when it's true haze and not yeast and trub in suspension. What yeast strain did you use for this? Nice, Imperial Juice is a great yeast. 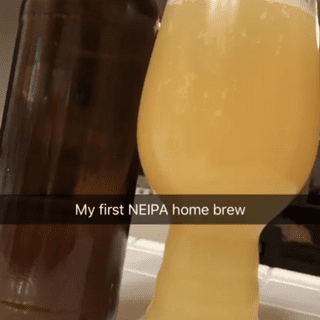 A great recipe for a NEIPA. Citrus mango peach explosion. Used the giga yeast. 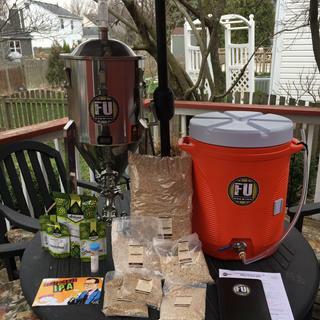 If you are a fan of IPA get this kit. Does not disappoint. This beer is the best recipe kit I have found so far. Very smooth and juicy! Others I have tried were bitter. Recommend this kit! Used the Imperial Barbarian yeast. I have another kit that I plan to use the Imperial Juice yeast in the near future. Why would you not buy this kit!? 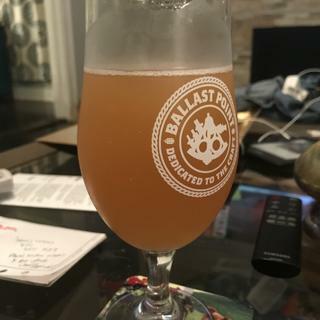 Had a hazy a few months back for the first time and I knew i had to make my own! 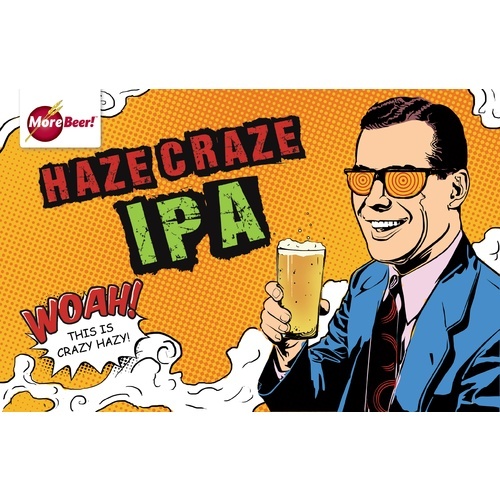 MoreBeer's Haze Craze fit the bill perfectly! Pitched Safale S-04, and it attenuated excellently. definitely would recommend this kit-nice representation of ne ipa style-great aroma-smooth bitterness and juicy. will be buying again. good, flavorful hazy beer kit and well priced. Ordered two of these because I heard such great things about this kit. I wasn’t disappointed. 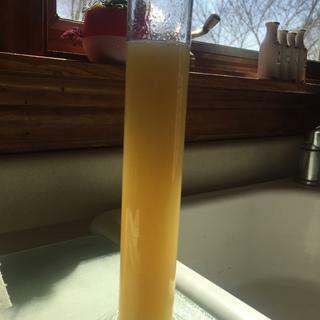 I fermented with Wyeast 1318. 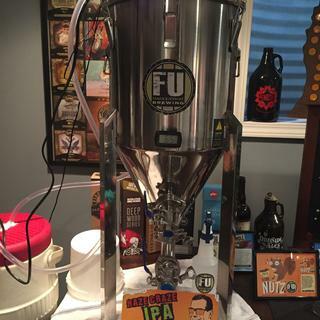 I have it in the keg now and it’s great! Juicy, hazy, delicious! My only issue was that I’m not getting as much aroma as I wanted. I dry hopped on day two in a muslin bag and then in the keg with mesh tube. Next kit I’ll dry hop on day three or later without the muslin bag. Great recipe! Haven’t tossed in the co2 or bottled yet, but expecting it to be really good! Yet another excellent recipe kit I've thoroughly enjoyed from more beer! Turned out great! This might be the best beer I’ve brewed so far. I used Hornidal Kveik yeast from omega to add more citrus and I couldn’t be happier with it. Will make this again soon cause it won’t last long! 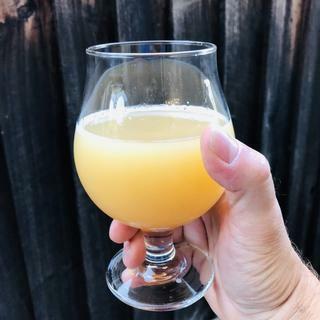 The best kit I’ve made and better than any commercial NEIPA I have tried to date. Perfect hop schedule, bitterness and aroma. I will be getting this kit again! Turned out great! Straw colored ale, super hazy but not turbid. Hop aroma and flavor were spot on, very 'juicy'. Good price on the kit. I altered slightly with a half pound more of flaked oats. It's been a hit so far, may do a dbl or triple batch next time, going way too fast. Smelled very tropical, especially at first. Easy brew. Hazy results. Worth the price of admission. I enjoy drinking this more than any other IPA I’ve brewed. I strongly recommend CO2 pressurized vessel transfers for this beer. II am not set up for this, so my version of this brew suffers from oxidation (darker in color and diminishing hop qualities - aroma). That said, kegged this 2 week’s ago and still enjoying. This is an amazing brew. From the whole cone hops at flame out to cracking open my first bottle, it has been an incredible experience. After the brew, we transferred the whole cone hops from the boil into primary, pitched London III yeast (no starter), and let it sit for 10 days. I was worried that it had been left too long in primary because the beer started to clear. Transferred to secondary (whole cone hops made this step a challenge) then added second round of pellets and let it sit for 14 days. To our enjoyment, the haze came back with a vengeance and it hasn't settled out. We bottled a week and a half ago with no issue and I just cracked opened our first bottle today. Carbonation is perfect and the haze still persists and won't settle. The aroma is citrusy and the flavor matches without any bitterness. We plan to brew a 10 gallon batch of this recipe next. 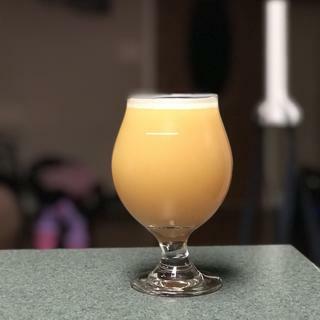 Very similar in taste and appearance to a very popular NEIPA made near Lansing Michigan. Ordered first kit, and it went fast. Tried to order more and they MoreBeer was out. Received an email a few weeks later that told me it was in stock, so I ordered two more. If you like this style, you will be very pleased. I mashed at 160, did not make a starter using the suggested Wyeast. Turned our great, but next I will use a starter. Made this four times and plan to keep going. It has a dedicated tap in my garage and it is a favorite among my extended family and friends. I've had a number of brewers try this beer and in our combined opinions, it is on par with some of the really big name popular NEIPAs. Just finish fermenting the all grain version last week and it turned out incredible. It is packed with dry hops and comes out super lush with flavor and aroma. I used the London Ale III 1318 and highly recommend you do the same. The yeast plays a really big part in this beer so make sure you don't just pitch a Safale-05! I brewed this all grain batch for the first time, used GIGA Vermont Yeast. Mashed at 151 using my RIMS system, fermented at 67 degrees for 4 days and then hopped in fermentor (SS Brewbucket) then transferred to corny keg and third hopped on day 7-10, pumped to new corny on day 11 till 15 at 65 degrees, crashed at 36 degrees on day 15 to 16 , hit with 13 psi for 10 days and served.........wow, what a grand brew, I have a new all time favorite. I really like the GIGA yeast, great finish. This kit is very well put together, I have brewed many of More Beers kits and they are all very good, but this one really hits it! Thanks More Beer for the wide variety of kits you put together, something for everyone....Thanks! I just kegged this today after a 12 day ferment, used the all-grain kit with the Giga Vermont IPA yeast using my Grainfather. Fermented in a bucket, dry-hopped loose and had to give the 2nd addition (at 7 days) a bit of a stir-in. Fermented at room temp here in Florida which was around 80F. I racked to a Corny keg through a BIAB bag to catch the inevitable hops and trub. I've really only had one NEIPA since they are rare locally, but this is very close in taste to the awesome Singlecut Billy 18 Watt that I've had multiple times in NYC. It's not fully carbonated yet, but it's like a glass of grapefruit juice. Yum! Low bitterness but nice hop taste and aroma. Don't turn up your nose at this stuff just because it's cloudy. Definitely worth a try and I'm brewing this again real soon! This is the best tasting beer kit I've ever purchased. It's absolutely delicious and has quickly become my all time favorite home brew. It's hazy, it's juicy and it's epic. I've had NEIPAs before and this is true to style and honestly better than many commercial examples. I'd recommend using Wyeast 1318 if you want the real deal. Purchase this kit...you won't regret it! Yes, very cloudy hazy brew. Used Vermont IPA GIGA yeast. 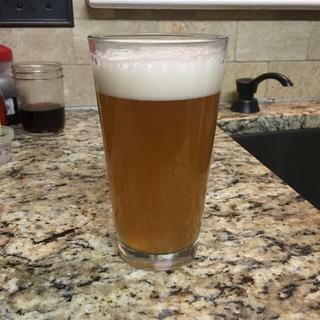 First East coast style IPA I've brewed. Came out great, good job More Beer! Would definitely recommend this kit! Mistakes were made on my part on the first attempt. I forgot to add the #2 flaked oats to the mash! By the time I realized, it was far too late. Interestingly enough the beer still came out very hazy, it just didn't have that soft mouthfeel and the abv was only 5.5-6.0%. It was a big hit with everyone who tried it. The 2nd batch was a smashing success. It came out at 7% abv and hit all the marks--super hazy, juicy stone fruit and tropical fruit flavor/aroma, soft mouthfeel, very low bitterness. Fantastic IPA that disappears faster than you can say "Haze me, bro!!" As far as the dry-hopping goes, in the first batch I weighed the bag down a bit, and in the 2nd batch I did not. Both batches turned out great and had tons of aroma. I'm just adding this for those who might be worried about it. Also, we had some hot days here in Oakland and my fermentation temp was higher than I would've liked. I was worried this would ruin the batch, but it had no detectable issues from it. Kegged it this past weekend so still not fully carb'd yet. However, samples are pretty juicy. Lots of fruit flavors more on the guava or tropical sweet fruity not so much the citrusy. Has a ton of hop flavor without the bitterness. I used white labs east coast ale with 1 tsp of gypsum and 1 tsp of calcium chloride for filtered Upland tap water . 1.060 og to 1.010 fg @ 65F. Shortened up the dry hop schedule first dry hop @ +3 days and than secondary @ +7 days kegged @ +9 days. Will brew again for sure. Just kegged this beer last weekend and have had a few samples. Amazing aroma of tropical fruit with just a little bitterness. I used the Burlington yeast and followed the dry hop schedule they provided. Would definitely recommend and will be brewing this again.